Save up to £500*on your next canopy | Able Canopies Ltd.
As we have talked before about how Able Canopies could help transform your outside space we can offer you a discount on your first canopy order with us. 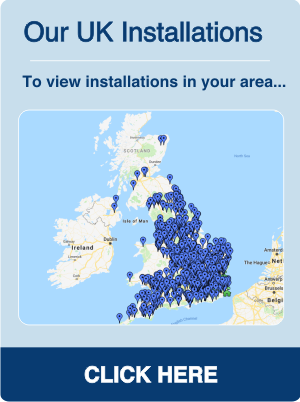 If you get in touch now you could still be in time to arrange your installation for the October half term Call us today to arrange you free site survey. We are also delighted to share our new product brochure with you. Inside you will find all you need to know about the canopies, shelters, awnings and shade sails from Able Canopies that can transform your outside space. Maybe you want to increase the opportunities for outside learning or dining? Maybe you want to provide shelter between two buildings? Perhaps there is a desire to install more bike storage to encourage more cycling? Whatever your need for outdoor weather protection we will have an answer. 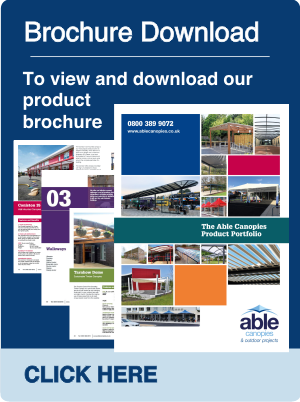 The brochure also includes details of our options and accessories that will help you to customise your canopy to suit the needs of those who will use it. Order now and save up to £500* on your canopy! up to the value of £500 off your order. To download a digital version of our new brochure, click here. If you need help with planning or have specific requirements that might require a bespoke solution, then do let us know. Our free planning service will help you with the documents and drawings required to help your project progress. Our experts have the experience and knowledge required to make this a stress-free process. We also have a Design & Build service that will allow you to create the exact solution you need to meet the needs of users and maximise the space you have. Talk to us today about what you need. 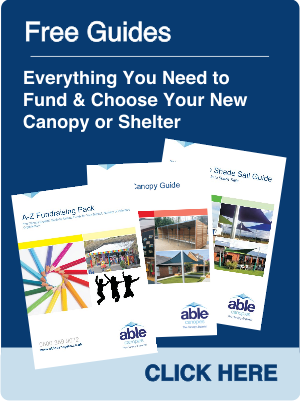 There has never been a better time to order your first canopy from Able Canopies Ltd.
and you could save up to £500* on your order. This offer is for a maximum of 5% discount on your order up to the value of £500. This promotional offer is only available to customers who order a canopy before the end of the promotional offer which is close of business Friday 22nd 2017. The promotional code must be quoted at the time of ordering. The product offer cannot be used with any other, or any previous, promotional offer from Able Canopies. The promotional product offer is not redeemable for cash. Minimum order value required £5000. Able Canopies reserve the right to withdraw or amend the offer at any time.